Artist's concept of Boeing's CST-100 Starliner capsule approaching the International Space Station. Crewed test flights by the CST-100 or SpaceX' Crew Dragon could be turned into crew rotation missions should those vehicles experience certification delays. WASHINGTON — NASA is beginning to study a contingency option for maintaining access to the International Space Station should commercial crew vehicle development experience delays, one that would turn test flights of those vehicles into operational missions. Speaking at the Federal Aviation Administration Commercial Space Transportation Conference here Feb. 8, Bill Gerstenmaier, NASA associate administrator for human exploration and operations, said using the planned crewed test flights as crew rotation missions was one option under consideration should neither Boeing nor SpaceX be certified for regular crew rotation missions by the fall of 2019, when NASA's access to Russian Soyuz spacecraft ends. "Those test flights might be able to be extended a little bit, fly a little bit longer, maybe fly a little bit of crew, and they could be kind of an operational mission," he said in response to a question after a luncheon speech at the conference. "That's something we're beginning to discuss with both SpaceX and with Boeing." In a later interview, Gerstenmaier said those changes would involve extending the length of the crewed test missions, currently planned for two weeks, to bridge whatever schedule gap until at least one company has a NASA-certified vehicle ready for regular missions. A third astronaut could be added to the two-person crew of the test flight as well to support station operations. Work on that contingency plan is just starting. "We haven't done anything with the contractors," he said. "We're in the process of just beginning discussions with them." He said the concept will also be reviewed by safety and engineering authorities within the agency. Gerstenmaier said he hopes to reach a decision by this summer on whether this approach is feasible. "We would know then the details of what's associated with exercising this option," he said, such as training test flight crews on ISS operations or contract modifications with Boeing and SpaceX. Gerstenmaier had previously hinted at work on such contingency plans. In testimony at a Jan. 17 hearing of the House space subcommittee on the commercial crew program, Gerstenmaier said that the agency was "brainstorming ideas to provide additional schedule time" should Boeing's CST-100 Starliner and SpaceX's Crew Dragon experience additional delays, but did not elaborate on those ideas at the time. At the FAA conference and the later interview, he emphasized there was no urgency to pursue those plans. NASA's access to the ISS through Soyuz seats, including those Boeing acquired from Energia last year as settlement for litigation involving Sea Launch and subsequently sold to NASA, runs through October or November of 2019, when the astronauts who flew to the ISS on Soyuz missions in the spring of 2019 return to Earth. Latest schedules from NASA on the commercial crew program include a crewed test flight — the final milestone before certification for operational missions — by Boeing in November 2018 and by SpaceX in December 2018. That would allow those vehicles to begin what NASA calls "post-certification missions" to transport astronauts to the ISS in the first half of 2019. "The current schedules show that we have margin," Gerstenmaier said in the interview. "We show roughly about six months or more of margin." 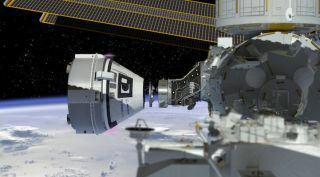 However, the commercial crew program has suffered significant schedule delays. When Boeing and SpaceX won the NASA contracts to develop their vehicles in September 2014, NASA expected to have both companies' vehicles certified by the end of 2017. That schedule has since been pushed back by more than a year. At the House hearing in January, Christina Chaplain, director of acquisition and sourcing management at the Government Accountability Office, said NASA's own internal estimates expected SpaceX's certification to slip to December 2019, and Boeing's to February 2020. "The delays and uncertain final certification dates raise questions about whether the U.S. will have uninterrupted access to the space station beyond 2019," she said then. Gerstenmaier said in the interview that planning for a contingency plan was a prudent measure even with the current schedule margin. "There's nothing that says we have to do this. It looks like there's still adequate time," he said. "The way I think of it is just to be prepared for any eventuality. Now's the time to start thinking what it would be."